Martin Scherber was of Nürnberg stock, born in January 1907, the son of the local orchestra’s double-bass player, Bernhard Scherber. He had a varied musical education and employment, reaching the post of conductor and musical director of the Aussig choir. His contract expired in 1933 and he returned to Nürnberg where he spent the rest of his life (except for war service) as a self-employed teacher and composer. As a young man he discovered the writings of philosopher Rudolph Steiner, whose founding work on anthroposophy (if you are like me, you will have to look it up) made a lasting impression on him and influenced his musical thinking. His œuvre is modest in size, and orchestrally consists of just three symphonies. Adriano, the Swiss conductor and composer came across Scherber whilst researching metamorphosing music, and realised that the first symphony had not been recorded. As he has done with many other neglected works, he set about the necessary hard work to achieve a recording and here it is, courtesy of Sterling Records. Returning to the first paragraph, my astonishment can be explained by hearing a symphony, composed in 1937-1938 that sounds remarkably like Bruckner! 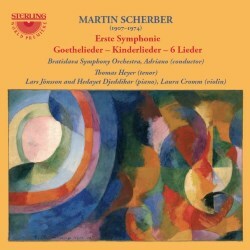 Martin Scherber composed his twenty-eight-minute symphony with the aim of achieving a work of concentrated “form”, into which the classical four movement structure would be incorporated. Not surprisingly, given the dates, critical reaction to the symphonies was not exactly welcoming: "The music is too much outside our time. And that it uses no appropriate, conformist tone language, a language to be seriously understood today, seems to me its greatest mistake, indeed, may be a fatal one. It is an absolute anachronism." (Peter Huber, letter of May 5, 2005. A-BRK-N) and "This music should be forbidden." (Hans Börnsen, 1957, after the première of the 2nd symphony, Archive of Bruckner-Kreis Nuremberg: A-BRK-N). However, Scherber had an underlying passion for form, order and internal coherence, derived from his interpretation of anthroposophy. He was so taken by Bruckner’s efforts to achieve this level of coherence (though not, obviously, via anthroposophy) that Bruckner’s own style came to significantly influence Scherber’s works.In fact, if you want to hear a 30-minute Bruckner symphony, or something that approximates one in terms of sound and thematic “presence”, then buy this CD, just do not expect the sort of transcendent masterpiece that a Bruckner 10th would have been. The orchestral playing is good, the performance committed and the recording is clear but a little lacking in front-to-back depth. The extensive notes in the CD booklet are very informative. A rather florid description of Scherber’s attitude to composition can easily be found in Wikipedia. The remainder of the disc is well filled with no fewer than forty of Scherber’s songs, of which twenty-seven meant for children are very short. The singer, Thomas Heyer, has a very pleasing voice, especially when he sings quietly. The accompaniment is ably shared between the two pianists Lars Jonsson and Hedayet Djeddikjar and, for the first of the Two Songs (1946), the violinist, Laura Cromm. The two children’s song cycles are Des Knaben Wunderhorn settings. They are suitably melodic, but the Goethe Songs are more interesting, showing Scherber’s melodic gift in a more rounded manner. I particularly like the melodic flow of the first of the Two Songs (1946) and its accompaniment for piano and violin is particularly effective. The longest song on the disc, at four minutes, is Hymn to the Night (Novalis), the last of Three Songs (1937), and is probably the most interesting of the lot. Translations for all of the songs are provided. It should be noted that Adriano has himself contributed to them. The booklet is incorrect in assigning track 15 to the violinist—it should be track 13. All-in-all, this is a very interesting and worthwhile recording. The symphony may raise hackles in some who will wonder what the composer was up to. I have not yet heard his second and third symphonies, and would like to do so. Presumably his style evolved somewhat, and the third is in one very large movement. Incidentally, this CD has been rated as no.8 in the top ten classical CD’s of 2017 in the Sunday 17th December Edition of the major independent Swiss Newspaper Tages-Anzeiger (Daily Gazette).